My three years in Miami allowed me plenty of time to sample the wonders of Cuban cuisine–ropa vieja, picadillo, caldo gallego, pressed sandwiches like the medianoche. Nothing charmed me more, though, than pastelitos, the flaky, ubiquitous turnovers (sweet or savory) served at every Cuban coffee joint in town. And the best of the pastelitos, by far, were guava filled. Guava makes me happy. It tastes of sun and citrus and tropics. Tart and red, it sings at dessert. Except when subjected to the dessert found on page 227 of Cuba Cocina. This recipe, for Capricho Habañero (Havana Whim), was yet another dish discovered during our Three Cubed adventures that, despite the potential promised by its ingredients (homemade caramel custard, meringue and guava) looked off on paper. And it was in practice. Basically the capricho is a strata. 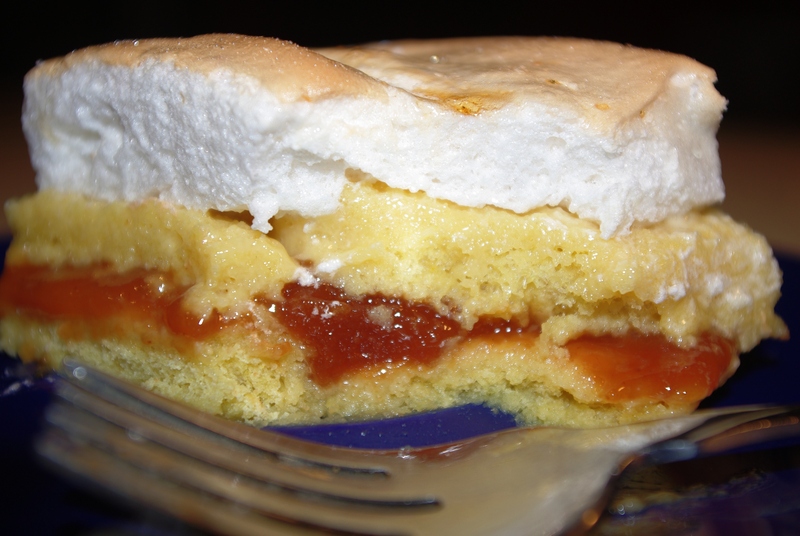 But the tiers of bread, covered with guava jam and custard, only makes a brief trip through the oven–to brown the meringue on top. The result is layers of stuff that do not meld, remaining in their constituent parts. And bread soaked in custard, no matter how good the custard, is still bread. I was tempted to just bake this before topping with meringue. But then I would not have been following the recipe. And while I am kind of inclined to try it that way — or to make a caramel-guava bread pudding (!) — I think I would rather stick to perfect, flaky, triangle-shaped pastelitos.